This Low-Carb Grain-Free Meatloaf with Tomatoes, Fennel, and Flax Seed is also low-glycemic, gluten-free, and South Beach Phase One. And it’s delicious! Use the Diet-Type Index to find more recipes like this one. 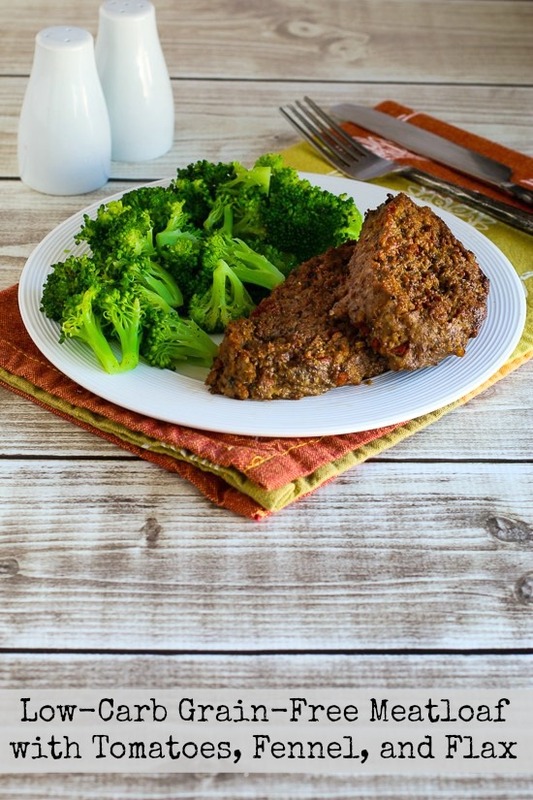 Click to PIN this Low-Carb Grain-Free Meatloaf with Tomatoes, Fennel, and Flax Seed! This Grain-Free Meatloaf with Tomatoes, Fennel, and Flax Seed has lean ground beef, turkey Italian sausage, roasted tomatoes or drained canned tomatoes, and flax seed meal instead of bread crumbs to bind the meatloaf together. This recipe makes two meatloaves, but it freezes well, and this delicious meatloaf will probably get gobbled up pretty quickly. I’m fan of meatloaf, so when I set out to make a Phase One meatloaf recipe, I came up with the idea of using flaxseed meal instead of bread crumbs so the meatloaf would be grain free. Flax seeds are very rich in nutrients, and the oil is popular as a nutritional supplement.But flax seeds are more nutritious than merely the oil because besides omega-3 fatty acids, the seeds are rich in both kinds of fiber and they also contain a phytoestrogen called lignans. And of special interest to carb-conscious eaters, flax seed meal has equal amounts of carbohydrates and fiber, which means no net carbs. The amount of flax seed meal I used in this recipe seemed perfect to bind the meatloaf together, but you could certainly use more. I used all dry seasonings so they could help hold the meatloaf together. In a bowl, combine dried onion, garlic powder, dried basil, dried parsley, Vege-Sal (or salt), ground fennel, and flax seed meal. Those wonderfully flavorful slow roasted tomatoes that I make and freeze every summer add a lot of flavor to this, but you could use well-drained roasted canned tomatoes (which would have less carbs). Chop the tomatoes very finely. Add the lean ground beef, turkey Italian sausage, chopped tomatoes, and egg to the bowl and use your hands to combine the mixture. (Don’t overmix.) I have a couple of mini roasting trays from the thrift store that I love to use for meatloaf because any fat from the meat drips down. (Be sure to spray with non-stick spray!) Jake did a nice job forming two good looking loaves. We cooked this for about 1 hour 30 minutes to get the internal temperature to 165F, which is the safe temperature for mixed meat. This was in my giant Thermador oven, and when I originally used a toaster oven on the convection setting, it took less time. If you don’t have an Instant Read Meat Thermometer, you can cut one open to see if it’s done. Make it a Meal: Serve hot, with a low-carb vegetable and something like Low-Carb Kale and Romaine Caesar Salad for a delicious low-carb meal. This Grain-Free Meatloaf with Tomatoes, Fennel, and Flax Seed has healthy ingredients and tastes good too! Spray roasting racks or loaf pan with non-stick spray. Remove ground beef and turkey sausage links from refrigerator and let come to room temperature. Squeeze turkey sausage out of casings in small pieces into the mixing bowl. Break ground beef into pieces and place in same bowl. Add slow roasted tomatoes, and eggs to meat mixture and use your hands to combine well. Try to mix the meat enough to get spices and eggs evenly distributed without over-mixing.Shape meat into two loaves. I prefer to bake meatloaf on a roasting rack as shown, so the fat can drip out. This meatloaf doesn’t have a lot of fat, but using a rack also browns the meatloaf well on three sides. Bake until the meatloaf is well done, 165F on the meat thermometer. 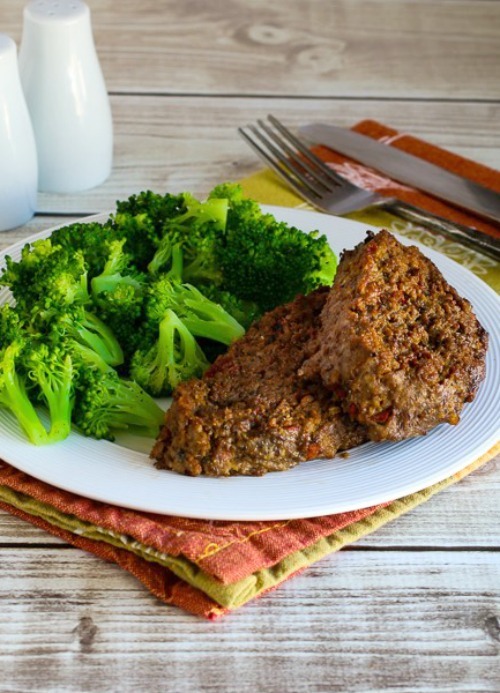 This Low-Carb Grain-Free Meatloaf with Tomatoes, Fennel, and Flax Seed with no breadcrumbs or oatmeal would be approved for any phase of the South Beach Diet and most other low-carb diet plans. For the South Beach Diet, they would recommend that you use lean ground beef and low-fat turkey Italian sausage. If you’re following a strict low-carb plan, you might want to use less tomatoes. Bonnie, I haven't tried grinding my own, but I do keep my flax seed meal in the freezer. Hope that helps! Have you ever tried grinding your own flaxseeds? I use a small coffee grinder to grind just the amount of flaxseed meal that I need. Once the flaxseeds are ground, they start to lose their nutrients so it's best to use it immediately.